Put a huge smile on your loved ones' faces and fill them with delight by giving them the Smile-inspiring Bouquet! 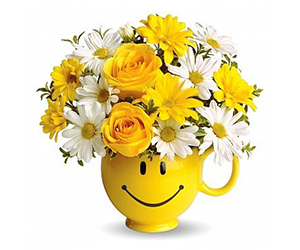 Arriving in a keepsake mug, that’s totally in harmony with the flowers, the arrangement includes yellow chrysanthemums, white daisies, some sprays and yellow roses! The smile-inspiring bouquet is a wonderful gift for Mother’s Day, St. Valentine, birthdays or any other happy occasion!